There is a centuries old tradition in Europe that is only beginning to be known in North America: the use of masonry heaters. 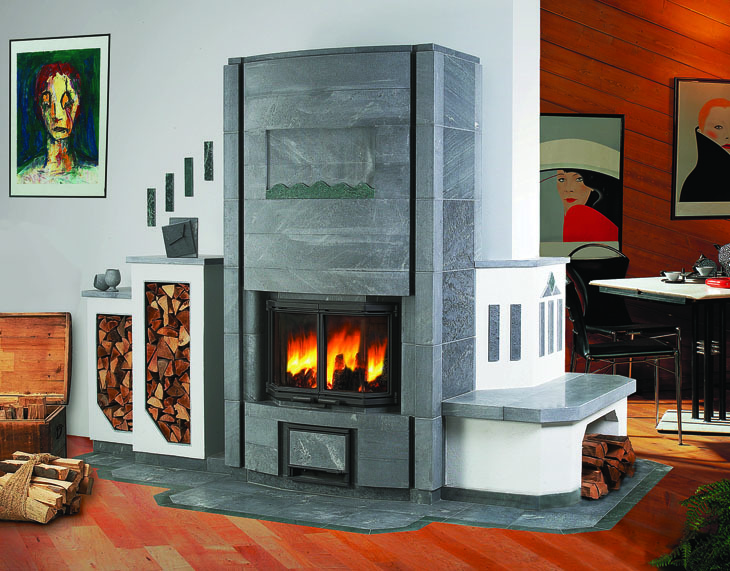 For some reason Americans are entirely familiar with wood stoves and fireplaces, but have only a hazy notion of what a masonry heater is. This is unfortunate because these devises represent the epitome in home heating comfort and efficiency! In his exceptional book, Masonry Heaters: Designing, Building, and Living with a Piece of the Sun, published by Chelsea Green Publishing, Ken Matesz explores every aspect of these works of art. 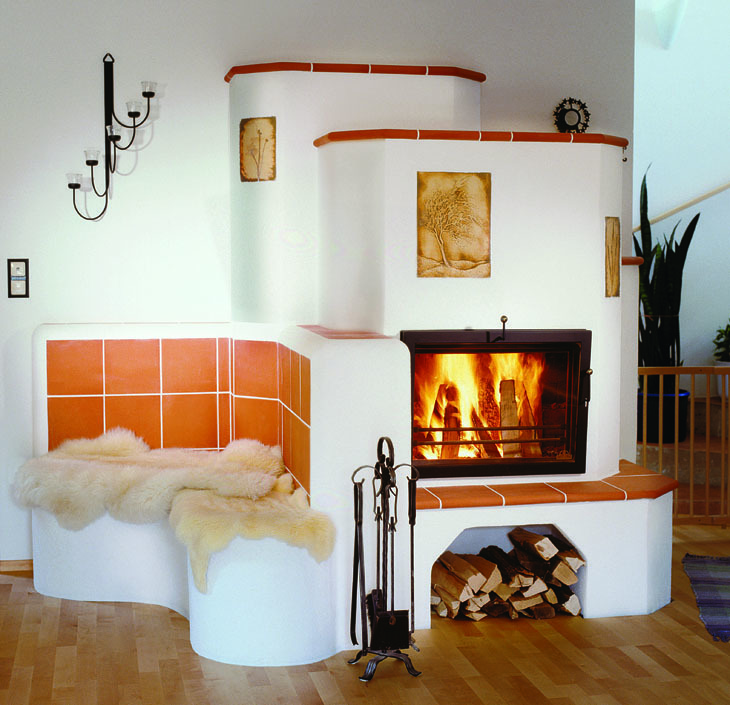 Also known as kachelofens, Russian fireplaces, Finnish fireplaces, Swedish stoves, contra-flow fireplaces, radiant fireplaces and mass-storage fireplaces, their basic functional design concepts are all similar, although their appearance can be vastly different. Matesz calls them "a piece of the sun" because the heat that they provide is the same as that given by direct sunlight. This is radiant heat that you can feel being absorbed by your body when you are in the presence of the heater. Wood stoves and fireplaces also radiate this type of heat, but not nearly as efficiently; as soon as the fire goes out the heat quickly dims away. Not so with a masonry heater. The whole idea with masonry heaters is to fire it only once or twice a day, building as big and hot a fire as the firebox will allow, giving it all the oxygen that it can consume, so that every bit of the fuel and the gases that are released are turned into heat. This is the cleanest, most efficient way to burn wood; there is virtually no creosote, hardly any smoke, and no fiddling with the fire over time. These heaters are often allowed in areas that have tight controls on air pollution because they burn so cleanly. The wonderful trick of a well-designed masonry heater is that it will absorb every bit of the heat from the fire into the masonry shell of the heater itself. It does this by directing the exit flue from the firebox through a labyrinth of unseen tunnels within the heater before any cooled fumes are eventually allowed to go up the chimney and out of the house. Once the mass of the heater gets warm, it gently radiates that heat for up to twelve hours...long after the fire has gone out. Often the heaters are designed with benches or areas where people can snuggle up to them to take advantage of the warm glow. They become like a welcome member of the family, one that people want to be near because of their radiant warmth. For this reason they are usually located at the center of the social area of the home, near the living room or dining room. Having such a prominent position in the house means that most owners want the heater to have a special presence, one that commands respect and admiration. Often the designs will lavish much attention on details and materials that speak of charm, durability and sometimes even opulence. Another option well worth considering is the inclusion of a bake oven or even a cookstove as a part or adjunct to the heater. People say that once you try what one of these ovens can produce you will be sold on the idea. Matesz has been designing and building masonry heaters for many years, and this new book glows with his expertise. He has a scientist's mind for analyzing all the variables that go into good design, as well as an artist's eye for the aesthetics that these durable works of art deserve. And as an author he writes very clearly, even passionately, about what he loves. This book is assembled with all the methodical care that he obviously lavishes on his building projects. This is one of the most beautifully illustrated books I have seen. There are color photographs on almost every page, and most of these are examples of the amazing variety that masonry heaters can embody. The book is worthwhile just for inspiration in how one might design such heaters, but there is also enough information to have a thorough understanding of all the elements that go into good physical design. I'm sure some are wondering how much these heaters might cost to have built. There are so many variables in size, configuration, and materials that the cost can only be given as a range. Matesz usually tells people that they cost around what you might expect to pay for a car. You might be happy with a basic Hundai or you might crave a top-of-the-line Mercedes, and so this is the range that you might expect. But bear in mind that a well made masonry stove can last for many generations and even outlast many of the homes where they reside. There are a number of kits available for either the core refractory materials and all the necessary hardware, or both this and the exterior cladding as well. Some of these kits are manufactured in Europe. Soapstone is the premier material for the exterior, since it has thermal properties that exceed all other stone, brick or stucco. 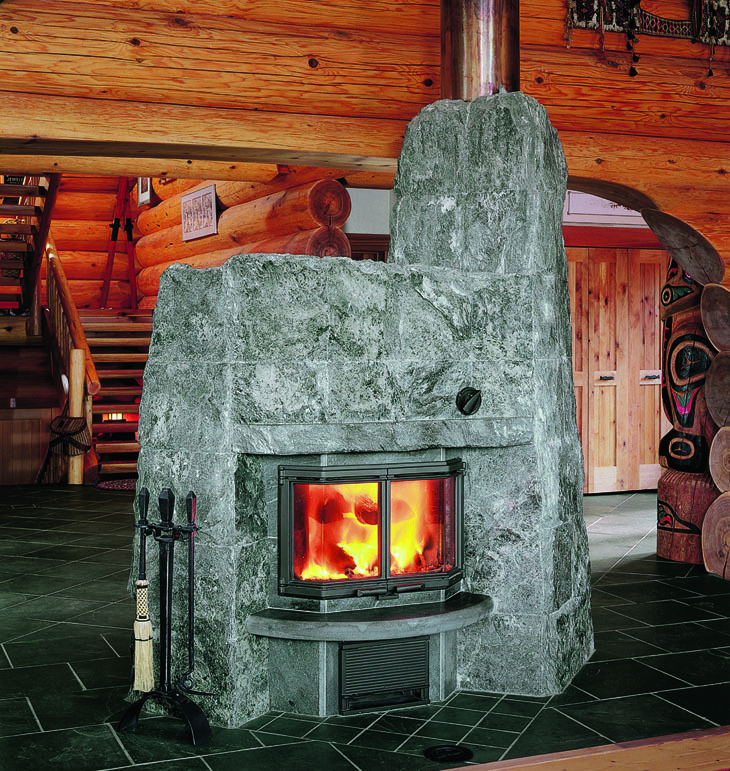 The ability of soapstone to store heat is remarkable. To my way of thinking, the very best way to heat a home is with passive solar, since it is totally free, clean, and requires little fuss to utilize. Unfortunately, in much of world the climate doesn't cooperate in providing abundant sunlight during the cold season. Furthermore, most houses do not really take advantage of the solar opportunity, so in these situations the next best option for heating could easily be with a masonry heater. To a large part, it is about energy independence. With solar you have this, and with a masonry heater all you need is a little wood (which can be odd scraps and tree parts that are not usually considered good firewood.) No matter if the electricity goes out or you run out of gas, or the price of these becomes intolerable, you can always still keep warm, without contributing to global warming. Wood is a renewable resource that reabsorbs CO2 as it grows, so there is a net zero emission. I would advise a would-be masonry heater owner to hire expert help for designing and building the appliance, but armed with this book, you would know everything necessary ask the right questions and to make good decisions. These are great ideas. They seem easily implemented as well. Thanks for the post. Thanks for the great review, Kelly! Your blog has a lot of excellent information. Thankfulness for taking the time to write.In this blog .I've got the information about Masonry Heaters... Thanks. I loved how the masonry heater was incorporated with the bench. Looks very clean with the white wall. Guess an advantage of having this in a home is the low heating cost.